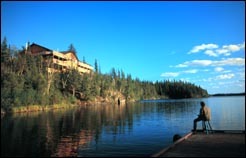 With over a thousand lakes, vast boreal forest and aspen parklands, you can let your imagination grow wings and soar. With over 200,000 square kilometres of land and water to explore, Northern Saskatchewan offers boundless opportunities for nature viewing, hiking, canoeing, biking, camping, historical and cultural learning, wilderness explorations, soft/hard adventures, golf, fishing, and so much more. In Northern Saskatchewan you can expect amazing sunsets, whispering winds, songs of the loon, and relaxation for you. Accommodations come in all forms. Bed and Breakfast operators can assist you with your experience. Parks can be your playground and Saskatchewan yours to explore.